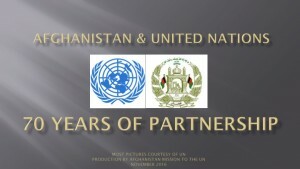 The Contracting Parties shall continue their political dialogue on the basis of the conclusions of the International Afghanistan Conference in Bonn of 5Â December 2011. The political dialogue shall particularly focus on the areas of bilateral relations, regional and international issues, good governance, and human rights. (1) Cooperation in the military field shall be accomplished through military training and bilateral annual programs. Both instruments will be renegotiated annually on the basis of available capacity, previous scope of use and their efficiency. Military training aid includes the training of members of the Afghan armed forces in Bundeswehr facilities in the Federal Republic of Germany. Bilateral annual programs are based on the principle of reciprocity above all and, in addition to official visits by high-ranking representatives, may provide for working and informational visits as well as bilateral technical discussions and discussions among experts. 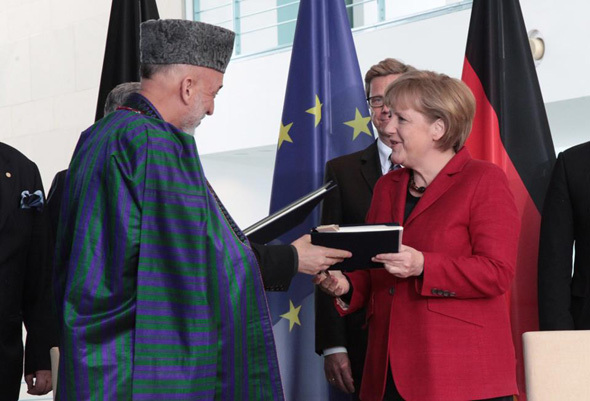 Separate agreements shall regulate the temporary stationing residence of members of the Afghan armed forces in the territory of the Federal Republic of Germany, mutual protection of classified military information, and the status of German military staff in the territory of the Islamic Republic of Afghanistan within the framework of cooperation measures. (2) The Contracting Parties shall continue cooperation in support the development of the Afghan National Police on the basis of the existing agreements and available capacity, through training and mentoring as well as project related support. (3) Germany will make an appropriate contribution to financing Afghanistan’s security forces (army and police force), as agreed at the International Conference on Afghanistan in Bonn on 5 December 2011. (1) The Agreement of 31Â January 1958 concerning economic and technical cooperation, last modified by the Arrangement of 19Â October 1978 and the Arrangement of 12Â July 2005 concerning the protection of the person and property of the experts and the members of their families belonging to their household seconded to the Islamic Republic of Afghanistan within the scope of German development cooperation shall be replaced as soon as possible by a framework agreement concerning development cooperation. Supplementary development cooperation measures may be implemented in other areas based on mutual agreements. 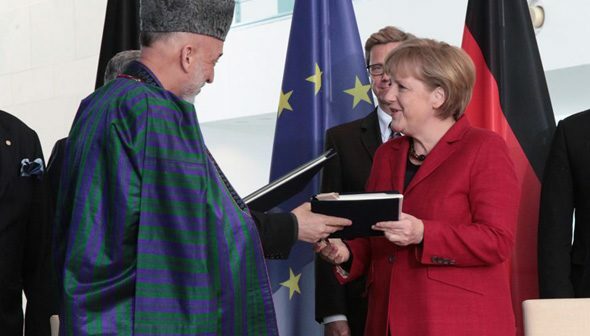 (3) The regional and sectoral focus of Afghan-German development cooperation and civil reconstruction shall be subject to agreement in the inter-governmental negotiations on development cooperation. (6) In order to be able to respond to the current and future political and developmental challenges, other areas of support may be agreed upon at any time. (1) On the basis of the existing Agreement of 18Â April 1961 on culture, the Contracting Parties shall, within the framework of their budgetary laws, agree on concrete measures for developing and enhancing mutual relations in the field of cultural policy. (2) Academic cooperation shall focus on broadly based cooperation in all areas of institutions of higher education, research institutions and academic organizations, Â organizations and establishments of non-school education and training for adults, libraries, and archives. (3) The Contracting Parties shall make possible and facilitate the promotion measures of the other Contracting Party in their territories as far as domestic law permits and support local initiatives and institutions in this context to the best of their ability. The Contracting Parties shall, within the framework of the relevant national legislation, facilitate the establishment and/or work in their own territory of the other Contracting Partyâ€™s institutions in the areas of culture and academia, such as cultural institutes, institutions of higher learning, academic organizations, research institutions, general and vocational schools, institutions for basic and further training for teachers, adult education or vocational education and training, libraries and reading rooms or other institutions completely or predominantly financed through public funds. (4) The Contracting Parties shall cooperate in the fields of preserving and maintaining the cultural heritage and protected cultural monuments, ensembles, and sites while ensuring the involvement of the relevant authorities according to national law. (5) The Contracting Parties shall expand cooperation in fighting the illegal trade of cultural objects. They shall make efforts to advance the ratification and implementation of the relevant international agreements. (1) The Contracting Parties shall continue their economic cooperation on the basis of the existing agreements. 4. Trade fair policy and implementation. (3) Regular, reciprocal visits by business delegations shall contribute to strengthening economic ties between the two countries. (4) The Contracting Parties affirm their intention to implement and develop the â€œJoint Declaration of Intentâ€ of 20Â June 2011 issued by the Ministry of Mines of the Islamic Republic of Afghanistan and the Federal Ministry for Economic Cooperation and Development of the Federal Republic of Germany in the interest of both countries. (5) The Government of the Federal Republic of Germany shall continue to advise the Afghan side on matters relating to economics and natural resources within the framework of Afghan-German development cooperation and, if needed, develop its advisory activities further within the scope of other forms of cooperation. (1) The Contracting Parties shall investigate further measures to support Afghanistanâ€™s aviation sector. 5. Operating concepts for airports. (1) The Contracting Parties shall establish a Afghan-German intergovernmental working group on cooperation. 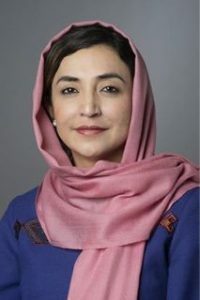 This working group shall be led by the Federal Foreign Office of the Government of the Federal Republic of Germany and by the Ministry of Foreign Affairs of the Government of the Islamic Republic of Afghanistan; it shall implement the regular dialogue as partners resulting from this treaty and agree on goals, priorities, and measures of future cooperation within the scope of this Agreement. The dialogue on Afghan-German development cooperation shall be conducted within the framework of the regular Afghan-German Â intergovernmental talks on development cooperation. (2) The intergovernmental working group shall monitor the projects to implement this Agreement. Afghan-German development cooperation measures shall be the subject of the regular intergovernmental talks on development cooperation. (1) The Contracting Parties shall aim for stable and transparent framework conditions for their cooperation. The Government of the Islamic Republic of Afghanistan shall support measures by the Government of the Federal Republic of Germany resulting from this Agreement and ensure that every form of state support by the Islamic Republic of Afghanistan will be made available in the country. The Contracting Parties shall ensure that all the authorities involved in implementing this Agreement are informed of its content in a timely and comprehensive manner. (2) Cooperation is possible in areas other than the ones named above. The Contracting Parties shall reach separate agreements concerning this. (3) The Contracting Parties shall upon request inform each other without delay through diplomatic channels of the authorities responsible for implementing this Agreement. (1) This Agreement shall enter into force on the date of signature thereof. (2) This Agreement shall remain valid for a period of five years after it enters into force. It shall be tacitly extended for successive periods of five years, unless one of the Contracting Parties terminates it by writing to the other Contracting Party through diplomatic channels at least one year prior to the expiry of any such period. The notice period shall begin with the date of receipt by the other Contracting Party. (3) This Agreement may be amended or supplemented in writing at any time if both parties agree. (4) The Contracting Parties shall settle disputes or differences of opinion arising from the application or interpretation of this Agreement through consultations by diplomatic channels. (5) Registration with the Secretariat of the United Nations of this Agreement concerning Bilateral Cooperation, in accordance with ArticleÂ 102 of the United Nations Charter, shall be initiated by the Federal Republic of Germany without delay following its entry into force. The Contracting Parties shall be informed of registration and of the UN registration number as soon as this has been confirmed by the Secretariat of the United Nations. Done in Berlin on May 16th 2012, in duplicate in German, Pashto, Dari, and English languages, all four texts being authentic. In case of divergent interpretations of the German, Pashto, and Dari texts, the English text shall prevail.